David Einhorn of Greenlight Capital believes Microsoft is a solid buy, and even though the company doesn't always get credit for its achievements, its business has been much stronger than the average company in the S&P in the past five years. His hedge fund currently holds around 9 million Microsoft shares and he openly recommends the stock, but the influential investor thinks there's one thing holding the Redmond-based company back: its CEO Steve Ballmer. Speaking at the annual Ira Sohn Investment Research Conference in New York yesterday, Einhorn said it was time for Ballmer to step aside and give someone else a chance. 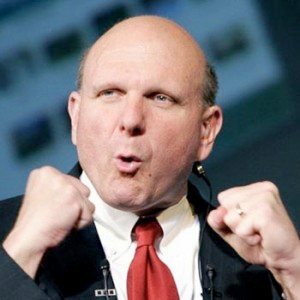 He criticized Ballmer's "Charlie Brown" style of management and claimed his continued presence is the biggest overhang on Microsoft stock. "Ballmer's problem is that he's stuck in the past," Einhorn said. "He's allowed competitors to beat Microsoft in huge areas, including search, mobile-communications software, tablet computing and social networking. Even worse, his response to these failures has been to pour tremendous resources into efforts to develop his way out of these holes." He argued that cloud computing is one area where Microsoft could excel, and said the company has one more shot at the rapidly growing smartphone market through Windows Phone 7 and its partnership with Nokia. According to Reuters, Einhorn's remarks echoed comments that some investors have said for years in private. Indeed the company's stock has dropped by more than 50% since Ballmer took over founder Bill Gates as CEO in January 2000, and in the last year has seen rival Apple grab headlines for passing it in in market value and quarterly profit. This week IBM also overtook Microsoft in market value for the first time in 15 years.